The problem with the HHS contraceptive mandate is not contraception. The Catholic Church opposes contraception, but it isn't trying to ban its use nor does it deny an insurance provider's ability to cover it if it chooses. The objection to the HHS rule is that by it, the government presumes to define what is and is not religious activity and essential church doctrine -- precisely the same claim the Supreme Court just shot down 9-0 in the Hosanna-Tabor ruling now appearing through the back door. In New York City, church groups are forbidden to rent public facilities open to all other citizen groups. In Alabama, if an illegal alien is dying at your door, it is nonetheless illegal to baptize him or hear his confession. The Connecticut state legislature recently tried to re-configure parishes as if that were any concern of the state. Universities such as U. California and Vanderbilt have driven Christian groups off campus. Do we believe in the First Amendment guarantee of Free Exercise? And if we concede government intrusion on conscience, how long do we think the freedoms of speech, press & assembly will stand? Therefore, tomorrow noon at a location near you, rally for religious liberty as a proxy for all liberty. (In DC, at Upper Senate Park, just West of the Russell Senate Office Building, and there are two sites in Maryland). 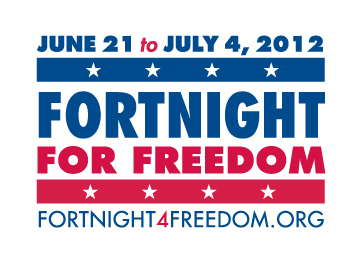 And June 22-July 4th, observe the Fortnight for Freedom. Read all about it in the excellent document prepared by the U.S. bishops ad hoc committee on religious liberty. Here are 18 ways to defend religious liberty. And for inspiration, go see For Greater Glory. Not a great movie qua movie, but intensely inspiring and moving -- and timed fortuitously.